ST. LOUIS – They don't miss Albert Pujols here. He's at home right now, resting up after knee surgery 10 days ago, maybe watching the St. Louis Cardinals romp to another World Series, maybe not. He's still got friends on this team, in this city, people who care deeply about him and think about him all the time. And they don't miss him, either. Because without him, nothing has changed. The Cardinals are still the team that sleepwalks through the regular season, treats October like a play toy and wins ballgames like it's some birthright. They are still packing Busch Stadium to the gills, serving cold beer and good times, and delivering jolts of electricity throughout the place like a live wire. Dominating the fourth game of the NLCS on Thursday night affirmed these truths, and the 8-3 victory against the San Francisco Giants that pushed the Cardinals to a 3-1 advantage in a series that could wrap up tomorrow reinforced one more. Think about that: They're fine without Albert. Think about what it signifies. The Cardinals lost the best hitter of his generation, one of the best ever, after a decade in which he led the team to two championships. He left the only franchise he knew for what amounted to $30 million and a few extra warm fuzzies from Los Angeles Angels ownership. The Cardinals needed to replace his production, his presence, his production, his gravitas, his production and his production. And to get over the idea, once inconceivable, that Pujols would abscond midcareer to Southern California, which is like St. Louis in a funhouse mirror. That last part was easy because the Cardinals understood: They had made the right decision not to match the 10 years and $250 million the Angels guaranteed Pujols. They approached an irrational market rationally. They faced an emotional decision with stoicism. They could have kowtowed like so many other teams have to stars with leverage. Baseball is not like football and basketball. There is no franchise quarterback. There is no can't-lose player. Mike Trout was the best in the game this season, and even with him Pujols couldn't make the playoffs. Yes, the Cardinals benefitted from a weak National League, one in which 88 wins bought them entry to a wild-card game, in which the outfield-fly rule helped them advance to the division series, in which an impossible comeback pushed them to the NLCS, in which they've asserted themselves with unrelenting authority on a Giants team happy to play origami. What emboldened the Cardinals most to let Pujols walk wasn't just the prospect of spending more than $200 million on a single player. It was their confidence in replacing him. And not just with Carlos Beltran, whose production matched Pujols' most of the season. St. Louis saw in Game 4 the group in which general manager John Mozeliak placed his faith – and rightfully so. There were Matt Carpenter and Allen Craig and David Freese and Jon Jay and Daniel Descalso and Pete Kozma, six home-grown players, all under contract for $508,000 or less. None of the nine other playoff teams featured as many drafted-and-developed starters, let alone that many with less than three years in the major leagues. Jay led off the game with a single. Carpenter walked. Craig popped a sacrifice fly. And off they went, these Cardinals with Matt Holliday, Yadier Molina and a six-shooter of kids. Forget Beltran's season and consider what a four-headed first base monster made up primarily of Craig, Carpenter and rookie Matt Adams did this season. Pujols' final numbers: .285/.343/.516 with 30 home runs and 105 RBIs. The Cardinals' first basemen: .293/.348/.485 with 21 home runs and 109 RBIs. That production problem? It was a myth. All for about 1/50th of Pujols' average annual value. "I think it goes back to the organization and the Cardinals, and we expect to win," Holliday said. "Doesn't matter who is on the team." Holliday alluded to "key figures that aren't part of the team anymore," and he wasn't talking about Octavio Dotel and Arthur Rhodes. For now, even if they're doing fine without him, Pujols still casts a shadow over the organization, and his defection is a seminal part of the journey the team believes it has taken. Pujols chose to leave. Pujols saw the initial five-year, $130 million offer his wife alleges the team made and found its length insulting. He left behind the comfort of the Midwest – the sort that friends of Pujols say he missed this season – for what amounts to a little less than 15 percent more money. 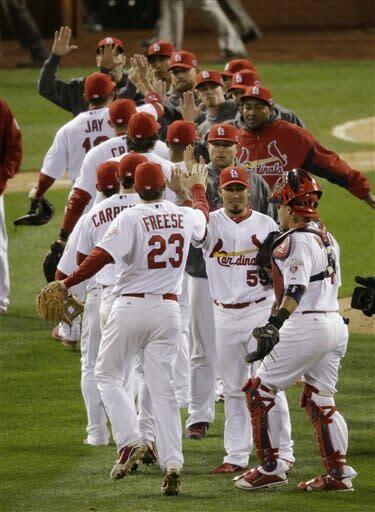 And it was the best thing that ever happened to the Cardinals. Pujols turns 33 in January, and no matter how legendary his pain threshold, he is in a race with Father Time, and Albert Pujols doesn't win many races these days. This is no slight to him. From the time he broke out of his early-season slump to when he injured his knee sliding Aug. 22, the old Pujols had returned with a vengeance, as though to say: Damn right I'm going to earn this $250 million. Try as he may, this was a losing proposition from the moment the ink dried on the contract. Unless Pujols is superhuman – and, considering his accomplishment, such a guess is better wasted on him than any other ballplayer of his generation – the last few years of this contract will be at best bad and at worst nuclear. Pujols isn't going to mack on any models during games, and whoever his manager, he will have enough respect for Pujols not to pinch hit for him, even if he is 0 for his last 100. Still, the prospect of such an aging curve is very real, and it's a burden under which the Cardinals will not, to their great relief, find themselves. Instead, they get to wonder how they're going to sign their young players to long-term deals, which is a really good problem to have, and if Shelby Miller or Carlos Martinez can develop into an ace to eventually replace Chris Carpenter, and if Oscar Taveras truly is the best hitter in the minor leagues, and all of the other things that occupy the minds of people in one of the last great baseball towns. Here, they value the team over the player, sometimes to a fault, though in Pujols' case the animus is understood. His rationale for leaving didn't compute, particularly considering just how much he meant to this franchise, this city, and how they returned the feelings until the end. It got too personal, and when that happened, not their history, not their future, not even Pujols' good friend Mike Matheny managing the team could keep him here. Nothing. 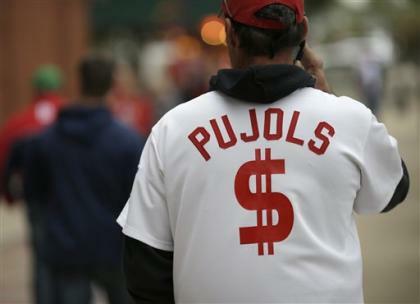 Eventually, Pujols will return, and the people here will forgive him. Which will be nice seeing as they've done what they can to forget him. Problem is, there are cues, so many, so often, that stir No. 5 in their minds. Before Game 4, Stan Musial rode around the stadium on a golf cart. The Man is 91. He's got Alzheimer's. Neither stopped him from sporting a red jacket and getting ferried around Busch to great fanfare, applause and appreciation. "I have so much respect for what he did here," Cardinals starter Adam Wainwright said, and the genuineness of his words was evident, even for someone who grew up in Georgia. Pujols was Musial's heir … until he wasn't. Now he's a Los Angeles Angel, blessed with an October on the mend while another team that wears red and white sits on the cusp of the World Series. As weird as the prospect of Pujols in any uniform aside from the Cardinals' seemed, here we are, in the Cardinals' time of year, and first base belongs to some kids, the third spot in the lineup to Holliday and No. 5 to nobody. No, they don't miss Albert Pujols. Turns out they never did.